Those who have access to a club have the option of granting access to more users. They have the option of given them 'Full access' or 'Restricted access'. To do this, please follow these simple steps. 1. When logged into the Database select the “Cog Icon” in the top right of your screen. 3. To add a user enter the email address (ensure the user has created and confirmed a SportsTG Passport) in the relevant field as shown below. If the user is granted restricted access only check this option then select add. RESTRICTED: Grants access to the database with the ability to enter match results, process clearances, view all information and configure reports. FULL: Grants access to the database with the ability to edit information, enter match results, process clearances and configure reports. Please note: Access to the database will now be linked to the users SportsTG Passport. 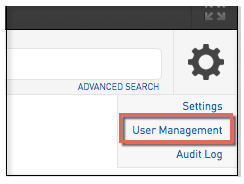 To remove a users access to the database follow the steps above and select delete from the User Management list.